"The mind/body workout that Pilates/Gyrotonic® rewards me with give me the strength and peace of mind I need to face the day." "I always leave Donna's studio feeling well stretched. However tired I am when I arrive, I find the exercises invigorating. And if you are a bit stressed, it doesn't hurt to breathe deeply too! I know I have gained strength in my back which is very important to me with a family history of osteoporosis, and my flexibility has improved as well." Pilates and the Gyrotonic Expansion System® share many of the same goals and benefits including creating a strong, flexible, healthy body. But the ‘no pain, no gain’ philosophy is a thing of the past! Both use minimal effort with precise movements, creating maximum benefits. They are great alternates to traditional weight training, which does not concentrate on the central, core muscles and can result in large, bulky muscles instead of the long, lean ones generated by both the Pilates and Gyrotonic® methods. Both systems develop mind/body awareness, are non-impact, and can be adapted to any level of fitness. They stress breathing and concentration, which are great for relieving tension and energizing the body. As each system has a slightly different approach, Pilates and Gyrotonic® are performed on specialized, sophisticated equipment created to support the movements and goals of the method. Pilates is a system of exercise developed by Joseph Pilates to overcome his own frail, fragile body, which he had as a child. He explored many systems of eastern and western exercise, taking the best of all of them, and ultimately becoming an accomplished athlete. He continued to develop his system in England where, as a German immigrant, he was interned in a camp during WWI. He used hospital equipment and began to work with injured and bed bound patients. Later, after coming to New York, he worked with many elite athletes and dancers, finally developing the system we recognize today as Pilates. Pilates aims to strengthen the core muscles of the torso, specifically the back, abdominal, and pelvic muscles. These are the main muscles responsible for posture and alignment. This results in improved strength, flexibility, and coordination. It teaches proper breathing, which is being emphasized more and more as one of the essential ingredients for optimum health. The system values the quality and precision of the movements rather than the quantity of repetitions. Performed mainly on two pieces of equipment, the Reformer and the Cadillac, most exercises are done lying or sitting, making it safe for just about anyone. The exercises are gentle while still gaining in difficulty as the body becomes stronger and more capable of performing increasingly complex exercises. 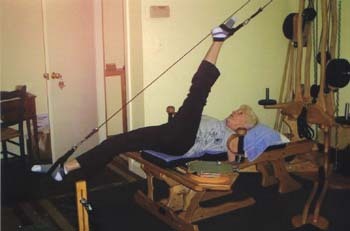 The Gyrotonic Expansion System® was created by Juliu Horvath, a dancer from Romania who was trying to find a way to repair many of the bodily injuries he suffered as a result of his profession. It includes movements taken from swimming, gymnastics, and yoga as well as dance. In the Pulley Tower, one of the main pieces of Gryotonic® equipment, he designed a machine around the structure of the human body, which allows for total freedom of movement. Pilates works on a linear and two dimensional plane, while Gryotonic® is three dimensional, creating circling, spiraling, undulating movements, taking the body through its natural range of motion in all directions. Because of this, it simultaneously stretches and strengthens the body with minimal effort. In addition to developing core strength, it focuses on increasing the range of motion of the spine and joints. It develops a strong, flexible body, and because it works the muscle groups in an integrated manner, it improves coordination and balance. Like Pilates, breathing is also an important aspect of Gyrotonic®. A bonus is that the breathing pattern along with the circling movements stimulates all the systems of the body including the circulatory, digestive, nervous and lymphatic (immune) systems, creating a better functioning, healthier body. Donna began her professional career as a registered nurse. She soon knew that she had to follow her true passion, dance. She earned both an undergraduate and Master’s degree in dance in England. While earning her Master’s, she was exposed to the benefits of Pilates. She studied in London under Alan Herdman, known throughout the world as a master teacher. A few years later, she added Gyrotonic® to her repertoire. In addition, she has completed a teacher-training course in yoga. 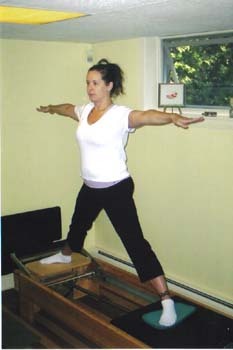 In 1996, Donna opened Balanced Body of the northshore, a small, intimate studio in Beverly Farms, Ma, where programs are adapted to the needs of each client. Donna also teaches dance at Glen Urquhart School. 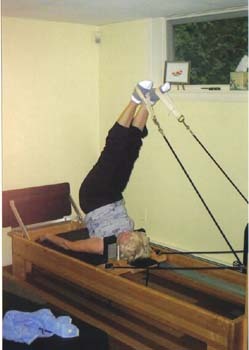 "A combination of Gyrotonic® and Pilates keeps my chronic back pain away. Donna has customized a program for me that works. With Donna's help, I am feeling well and looking fit."